SAM SCHUERMAN: Best Perfume I've Ever Sniffed!!! Best Perfume I've Ever Sniffed!!! I got my Ulta catalog for September in the mail today which is always an exciting moment for me because it includes samples of perfume and my $3.50 coupon haha! I knew as soon as I sniffed this sample of Marc Jacobs "Honey" ($92.50 for 3.4oz) that I had to tell you guys about it and it instantly went on my wish list. Here's the sample I got in my Ulta catalog :) I must have sniffed it about 20 times and Phoenix sniffed it about 10, saying "Oh nice babe!" 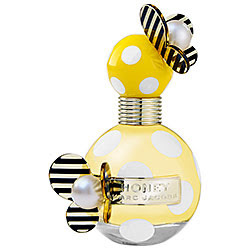 Honey by Marc Jacobs is a sunny, delicious floral—energetic and alluring, with a sparkling, golden touch. The perfect mix of brightness and warmth. This buzzing fragrance energizes with the freshness of green pear and a bright splash of fruity punch and juicy mandarin. Orange blossom resides at the heart of the fragrance and mingles with the nectars of honeysuckle and peach for a note of sparkling femininity. Honey, vanilla, and smooth woods dry down to a warm, golden base. Pear, Juicy Mandarin, Orange Blossom, Peach Nectar, Apricot, Honeysuckle, Honey, Golden Vanilla, Smooth Woods. The scent of this is like heaven. It's feminine, subtle, sweet and floral at the same time. This is one of those scents you just can't stop sniffing and I MUST HAVE IT!! It's literally the best perfume I may have ever sniffed in my life and I've sniffed a lot! This is definitely on my MUST PURCHASE SOON list. I highly recommend the next time you are at Ulta or Sephora, get a sample or just go and have a sniffy wiffy :) Let me know how you like it. If you do have it, how does it wear? Is it one of the delightful ones that stay smelling amazing all day long? I just had to share this with you because it is the best scent ever! Wanna make your teeth look pearly white without having to use whitening products??? I will also go to Ulta and get a sample--or at least try some on. I LOVE perfumes!!! SO thank you Sam!! Thanks for sharing this video and information. It is really nice. We have some free samples of perfume and many more items. I simply want to mention I’m very new to weblog and seriously enjoyed your website. Likely I’m want to bookmark your blog. You definitely have amazing writings. Many thanks for revealing your website. Because of the demand of this perfumes, many people have decided to start up shops selling these products and for those who cannot access the products in the malls, the internet is also available with all the different kinds of Joy perfume. Fall "Window" Shopping with BS! Lily's First Birthday Party in Pictures! Nails of the Week: Hot Pink & Silver Sparkles! Gel Nail Polish At Home: Is It Worth It?